As with all new and bright shiny objects, people are quick and eager to make blind and wild predictions, and Facebook’s Graph Search is an excellent example. Facebook announced Graph Search on January 15th, and there are already 100’s of articles published on the possibilities, including how Graph Search will challenge Google in advertising, Match.com & eHarmony in online dating, Yelp and others in services, travel and entertainment, and yes, even LinkedIn and Monster in recruiting. When Mark Zuckerberg himself says “One of my favorite [Graph Search] queries is recruiting. Let’s say we’re trying to find engineers at Google who are friends of engineers at Facebook,” it’s hard to not get excited about the possibilities of tapping into the data Facebook has on over 1,000,000,000 users globally, and over 167,000,000 users in the U.S. alone. Don’t worry – this isn’t another Facebook-Graph-Search-is-an-awesome-disruptor article. Rather than throwing fuel on the Graph Search fire, I am happy to throw a wet blanket instead. Don’t get me wrong – I’m excited to use Graph Search, and I know sourcers and recruiters will be able to make use of it. However, there are some major limitations to Facebook and Graph Search specifically that I want to recognize and bring to light that will clearly explain why it isn’t a threat to LinkedIn. Facebook appears to be respecting privacy settings when it comes to what people can retrieve and see with Graph searches. That’s obviously good for users, but not so good for sourcers and recruiters. While anyone can use Graph Search to search for information (e.g., software engineers at Google), you can only find that which has been shared with you on Facebook, either directly (friends) or indirectly (friends of friends, and content set to “public”). While you can no longer opt out of showing up in search results on Facebook, anyone can change their Facebook privacy settings to friends only for their work experience, which is what sourcers and recruiters want and need. While there are some people who seem to think many people won’t bother (or think) to lock down their work data, I am not so optimistic. With the announcement of Graph Search, there has been a massive wave of how-to-lock-down-your-Facebook-profile-data articles and similar content aired on TV in reaction to Graph Search – and it’s been less than a week. Don’t get me wrong – if someone doesn’t want to share their work history with the entire world on Facebook – it’s their data and their right to privacy. However, the simple fact that Facebook users can and will set their work and education data to friends only will massively limit the potential of Facebooks Graph Search as a sourcing and recruiting tool. Imagine if all of the professionals on LinkedIn could effectively “turn off” their work experience (titles, companies, etc.) so that only their 1st degree connections (the equivalent of Facebook friends) could search for and find them based on this data? That would drastically limit the value and the power of LinkedIn, wouldn’t it? The value of data is directly tied to it’s “searchability” and thus its ability to be retrieved. The ability of people to essentially make their professional data opaque to most Graph Search users drastically limits the value and power of Graph Search for sourcing and recruiting. Speaking of professional data on Facebook – there doesn’t seem to be much of it. 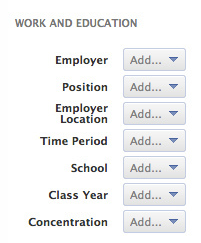 I’d love to see the percentage of people who actually enter work information on their Facebook profile. I suspect it’s quite low, but I’d be thrilled to be wrong. Outside of my Facebook X-ray searching efforts, I’ve also checked the profiles of many of my 452 friends on Facebook, and other than those who are in sourcing/recruiting/HR/talent acquisition, most don’t have work experience on their profile. Looking at some of my I.T. friends (real friends – as in the people I went to high school and college with), there are a few who do have some work experience listed, but interestingly, not their current employer/title. However, when I cross reference them on LinkedIn, I can find their current employment information. This is a great example of how, unsurprisingly, people use Facebook differently than LinkedIn. Yes, I know, with a billion+ Facebook profiles and over 167M in the U.S. alone, even if a small percentage of people on Facebook entered work information on their profiles, it would still add up to a decent number of people with professional data. However, if even 25% of US users on Facebook have professional data on their profiles, that would still only be about 42M people. In comparison, 100% of 74M U.S. profiles have professional data, as you can’t create a LinkedIn profile without entering company and title info. Nearly half of all U.S. Facebook users would have to enter company and title information in their work history to equal LinkedIn’s figures. 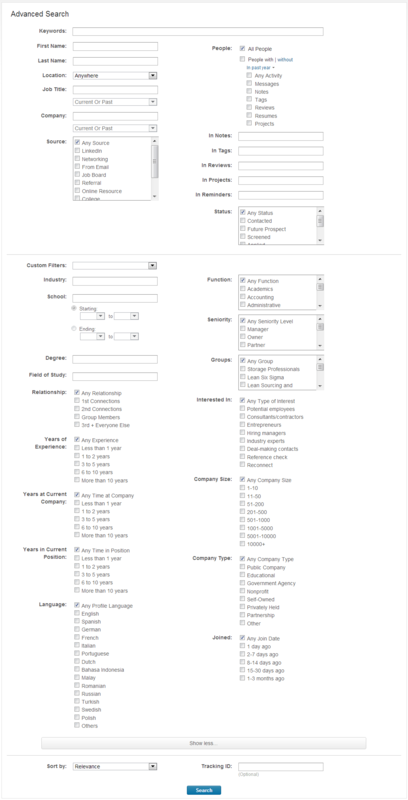 Even then, a good portion of LinkedIn profiles are filled out to resume-level detail, providing much more value to the information retrieval process to find people with specific experience. While it’s nice that the recruiters at Google and Facebook can simply search for software engineers at each other’s companies without regard for any specific level or type of experience – most employers are looking for people with very specific skills and experience, where title and company searches simply don’t yield people with the right experience. When it comes to sourcing and recruiting, the value of human capital data is directly tied to its depth. Shallow data limits search specificity and thus predictive control over critical candidate qualification variables. While the information retrieval enthusiast in me appreciates Facebook’s approach to entering natural language queries, the engineers at Facebook certainly weren’t thinking of giving users the ability to translate their recruiting needs beyond the surface level. However, the search refinements for work experience aren’t too bad, as they do allow you to target employer, position (title), location, and time period, which would enable you to target people currently in a specific role at a specific company in a specific location. What’s obviously missing is any ability to enter Boolean queries. However, when you look at LinkedIn’s search options for people with a free account, Facebook’s work and education search options compare relatively and surprisingly well. Similar to Facebook’s Graph Search refinements for work and education, you can target employer, title, location, and time period, which of course allows you to target people currently in a specific role at a specific company in a specific location. Beyond what you get with Facebook’s Graph Search, LinkedIn’s search interface allows you to be more specific with regard to location with zip code search, the ability to target industries and language, and of course the ability to run full Boolean queries in every field, which is a significant advantage when crafting searches to find people with specific skills and experience. Searching for people based on your social graph can certainly be helpful, but in reality, anyone’s social graph only represents a small sliver of the total talent pool. As such, sourcers and recruiters really need to be able to search across the entire talent pool based on your search criteria, regardless of how or whether or not you’re socially connected. 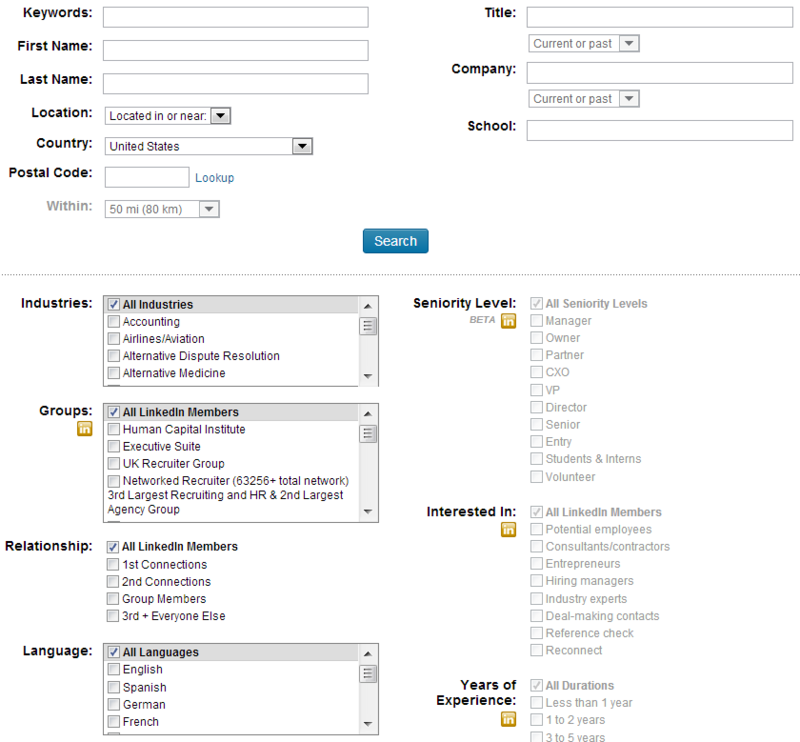 As it stands, you can’t do this with Facebook’s Graph Search, but you can with a free LinkedIn account. 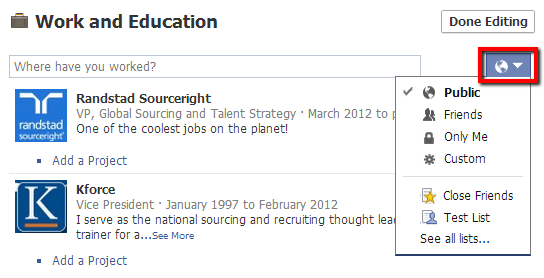 Of course, Facebook’s Graph Search is free, so it may not seem fair to compare it to LinkedIn Recruiter. However, if people are going to continue to write articles about how Facebook’s Graph Search is a threat to LinkedIn, I believe it actually is fair to compare the two. I don’t think any companies who are currently paying for LinkedIn Recruiter are going to look at Graph Search and ditch their LinkedIn accounts, let alone reduce their spend by 1 license. At the moment, Facebook’s Graph search is in no way, shape or form a threat to LinkedIn. Somehow make work information more searchable/visible to anyone. I don’t see how this could happen given Facebook’s privacy controls. However, I have some ideas as to how they might try to pull this off without causing a riot. When it comes to sourcing and recruiting, the value of human capital data is directly tied to its retrievability, depth, and searchability. The fact that Facebook’s privacy controls allow anyone to make their work history opaque to anyone other than their friends or friends of friends severely limits the retrievability of the data that sourcers and recruiters need to do their job. I don’t think it will take long for folks to get smart – at least the ones that are hunted like animals such as I.T. folks – they will “hide” their professional data from people they don’t know so they simply cannot be searched for and found. There are already software engineers on LinkedIn who purposefully eliminate words from their profiles to be harder to find and identify by sourcers/recruiters. It also doesn’t help that the average person doesn’t seem to think to enter their work history on their Facebook profile. Quite simply, if it isn’t there in the first place, it can’t be retrieved and leveraged. Although Zuckerberg and other Facebookers have made specific reference to the ability to use Graph Search for recruiting, in its current form, Graph Search’s functionality only allows for the retrieval of basic information such as roles and companies. While you can certainly recruit with this limited level of information, there is really only so much you can do with it, assuming of course that it’s even there to be found, let alone visible to you based on user privacy settings.